took down the cardboard box on the top shelf, which has light bulbs in it. I cleaned out the box itself and removed 9 light bulbs (one of which I used right away) and 7 packages of mantles for a gas outdoor lamp, which we no longer have. I read all about your new home and your mission to help the children and about Nhiet. You are an amazing person Betty Jo and you have passed that down to your son and he to his family it would seem. You must be so happy to be able to be living with them again. How is it that you managed to overcome your allergy issues with the house? Smallest place ever? How small is that? Oops! I had the wrong contact info in that last comment. It’s corrected now. that was quite a transformation. Well done. 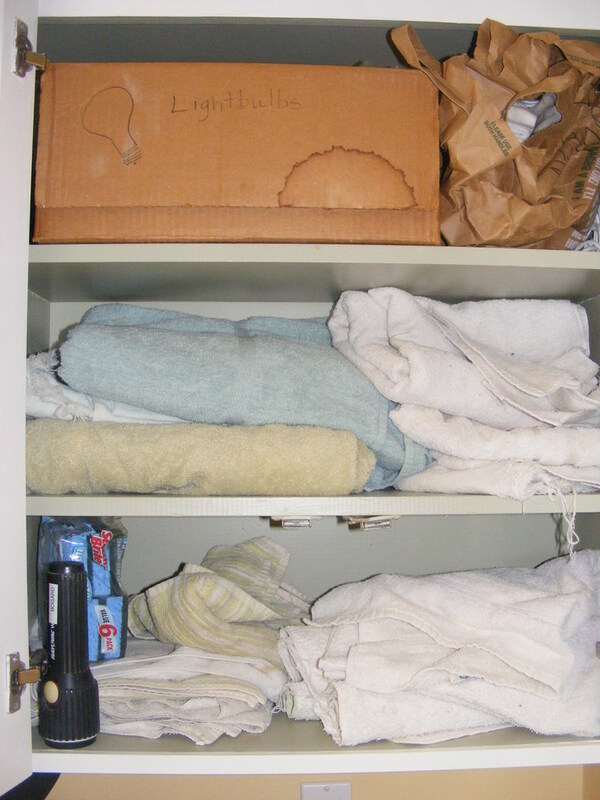 It seems like you, Cindy and I all have a very similar style utility cupboard on our laundries, what a weird coincidence. Thanks Jess. 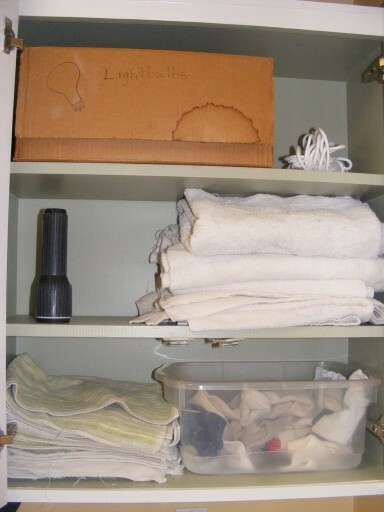 Your laundry room closet looks great. I didn’t transform my laundry room because it is also the pantry and it is all organized. Mom is never happy with it because she has to stack things and forgets to pull out the baskets I installed so she can get to everything. Grin. I DID have a good time this week doing most of the things on the list for this week’s Mini Mission Monday. I had a small 1-drawered container that I had been keeping loose pictures as well as card/layout/craft ideas I had cut out of magazines and adhered to cards. I took everything out and either placed the pictures where they belonged in albums, got rid of duplicate pictures that no one else would want, scanned the ideas and stored them in a computer file, or tossed those ideas I decided I really didn’t plan to use. It was great. On Friday I realized that I no longer needed the container so gave it to a friend who is working on organizing her craft room. I went through the bookshelves again and ended up with 3 piles of books to give away—they were each 2-feet high. One pile was just Bibles I had either been given or got free. Only one had ever been used. I decided that some were translations that weren’t really my favorites and I didn’t need them. Some were duplicates of ones I already had. I am giving them to the pastors at church to either have for themselves or give away. Another pile of books is going to be given to the library. The last pile is being divided between three friends who will be excited to have them. I have already asked if they want them. They are either Bible study helps, craft books or computer books. Wednesday’s and Saturday’s tasks were related for me. I don’t have this one done. I had reversed them and was working on some some keepsake jewelry when I realized that the things I had planned to work on as someone else’s clutter fit into this work too. Basically the only thing I have of a keepsake type of thing is jewelry that has been given to me by some person or other and most of it has ended up in Mom’s jewelry because she wouldn’t let me get rid of it. In talking to her I think she is ready to get rid of a bunch of it. That means sitting down with her sometime next week and going through it all. I didn’t do anything to my closet because it is down to bare bones. My closet is 4 feet long and I have everything I own in the way of clothes in there and there is plenty of space. About 3 months ago I got rid of everything I can’t wear right now and then took out the stuff I can wear but don’t like so end up ignoring. It’s wonderful. It’s been a good week. Ah! Freedom. Well done Deb J you have had a very productive week it seems. You have decluttered, sorted stuff, donated stuff, given stuff to a friend and even got your mom in on the act. An all round good effort. ✰✰✰✰✰ Five stars for you! I was reading this post and feeling very impressed, but I hadn’t really noticed who the writer was. I said to myself, “That sounds like Deb.” Sure enough! Good job with all you’ve accomplished. It was just one of those weeks that was a good chance to do something. Now out of this weeks mini mission only the pantry is even a possibility but I’d love to get in there and have a go. Now if I can just talk Mom into it. I’m on a roll and I hate to have to back off. Grin! Weren’t you avoiding the wardrobe, too, and it wasn’t as awful as you thought it was going to be. Get in there! Wow, that puts into perspective how much we really have verses how much we need. Neat video. I watched the whole thing. Thanks for sharing it.